Including gear rental, book, logbook and license only. Course duration is 3 days. Additional cost will be room, meals, boat rental and dive pass. What is PADI Open Water? Virtually anyone who is in good health, reasonably fit, and comfortable in the water can earn a PADI Open Water Diver certification. You must be older than the age of 14 to begin the PADI Open Water Diver program. For those of you who are not above the age of 14 and would like to participate in the PADI Open Water Diver Program, then the PADI Jr Open Water Diver program is available to you. If you are between 10 and 14 or have a child between these ages, there is a PADI Junior Open Water Diver program available. A PADI Jr Open Water Diver between the ages of 10 and 11 years may only dive with a PADI Professional, a certified parent or certified guardian to a maximum depth of 12 meters/40 feet. 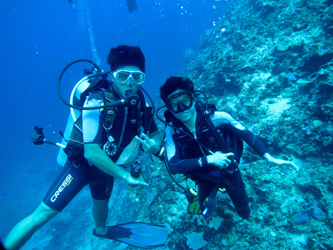 Throughout the course, youll learn fundamentals of scuba diving, including dive equipment and techniques. You earn this rating by completing five pool dives and knowledge development sessions and by making four open water dives. 3 full days . PADI programs are performance based. You proceed as you demonstrate mastery of the course skills. This allows you to work at a pace that is comfortable for you. Continue the adventure with PADIs Adventures in diving program, or PADI's Advanced open water diver course, you next step in exploring the underwater world.